Where did you source that mantle? Great idea... but i wouldnt know the first place to look to purchase a mantle. That particular mantel is a vintage (old) piece, so the best place to find something like that is an architectural salvage place, antique store or auction. Wall and trim color please and thank you! Where is the bedding from? Duvet? Mantel - What paint color is the mantel? Would you mind explaining how your curtains are hung? Thanks for your help! Salvaged mantel. Moving on from wood but staying in the salvaged arena, a salvaged fireplace mantel is a stunning idea for a twin-size bed. Most architectural salvage yards carry a variety of these. The more weathered the better for a charming country look. An old mantel can be spruced up and given a new life as a stunning headboard. You can display knickknacks, store books or even place small reading lamp on the shelf above your head. 9. Stripping old paint. Don't take a chance with this one. Paint that dates from the late 1970s or earlier could contain lead, and breathing in the dust as you scrape it off may lead to health problems. Protect yourself and your family by turning the job over to a licensed lead-abatement contractor. Let’s face it, kids are never averse to climbing all over the furniture. Have a little fun by hiding Easter eggs in places slightly out of reach, like a vase on a shelf, so they have to put in a little physical effort. I was surprised to see this well-worn fireplace mantel repurposed as a headboard. It's a really great idea that Mike and I are going to have to consider. The look you create will depend on the mantel you find. 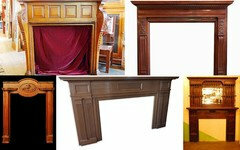 It could be a huge old oak surround, antique cast iron or a brightly painted contemporary design. Whatever you decide on, consider choosing nightstands and dressers that make the room totally personal to you. And never buy a matching bedroom set from the furniture store if you want a bedroom that sings your song. 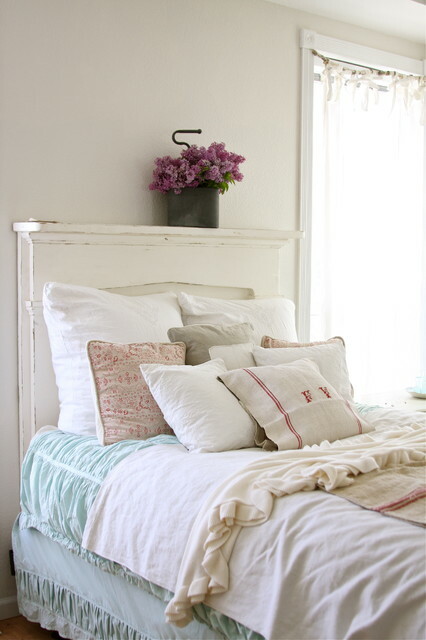 This bed has a fantastic mix of old linens, inviting you to snuggle in them for a lovely afternoon nap. And don’t you love the headboard made from a fireplace mantel?By the way, just for the sake of clarity, let’s define some terms. Linen has been woven for more than 4,000 years in Egypt, so it’s one of the oldest-known fabrics — it even appears in the Bible! Linen is made from the flax plant and is one of the most durable natural fabrics you can find, becoming softer with every wash. People who know about such things say that Queen Elizabeth II is still sleeping on Queen Victoria’s linen sheets.Since the 18th century, cotton has replaced linen in many fabrics, including chintz, toile and table damask. Yet the collective term “linens” is still used generically to describe a whole group of woven and even knitted bed, bath, table and kitchen textiles that traditionally were made from linen, but now could be made from various materials. For the purposes of this ideabook, I use the term in that generic sense. Layer the look. Mismatched schemes work best when they are styled with abundance, so don’t hold back. Further enhance a combination of sheets and covers by adding a wealth of pillows in soft, gentle tones. Here, a grain-sack pillow cover adds a little contrasting texture. Well-worn fireplace mantel repurposed as a headboard. Before and After Photos of Shabby Chic Bedroom, Lewiston, New York.